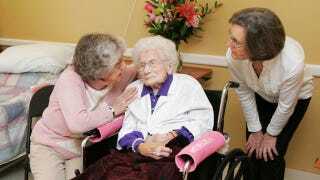 During a ceremony at her nursing home, 114-year-old Besse Cooper was named the world's oldest person by Guinness World Records. Previous record holder Eunice Sanborn of Texas passed away in January at age 114. Cooper has four children and several grandchildren and great-grandchildren. When asked how she stays healthy, she said, "I mind my business and I don't eat junk food."